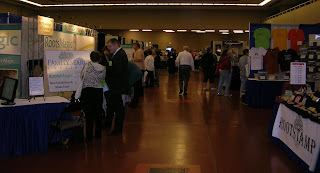 As promised, here are some of the photos I took while at the Mesa 2009 Family History Expo. Holly Hansen, Kimberly Savage and Janene Morgan (Executive Mother Hen) are the women behind Family History Expos. Their hard work and dedication to bringing the best quality speakers and vendors to their expos was evident in Mesa. Great job, ladies! There was a good number and selection of vendors at the expo. What better way to spend your money!? 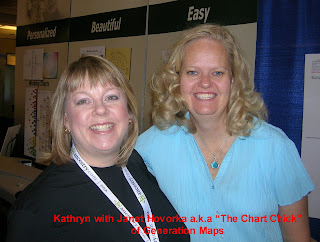 After attending The Chart Chick, Janet Hovorka's interesting and informative session about charts, I wanted to meet her in person. She is a friendly and knowlegeable person. I am going to have to review my family files and have some charts made by Janet's company, Generation Maps. Yes! DearMYRTLE was there, sharing knowledge in her warm and friendly way. I attended her session, "How to Find Where to Look". I learned there are lots of places to look on the FamilySearch website. Myrtle's suggestions and tips are going to keep me busy for the next little while. Ol' Myrt (as she likes to call herself) really is your friend in genealogy. 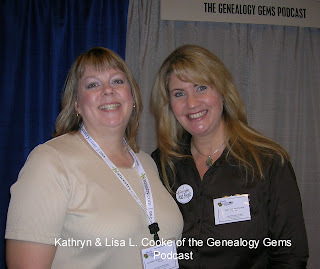 I'm sure you are familiar with Lisa L. Cooke of the Genealogy Gems Podcast. 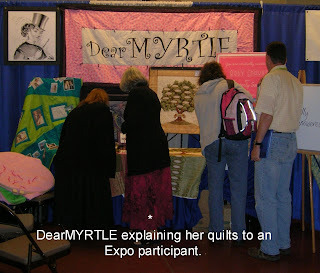 I had the pleasure of meeting Lisa this past February at the St. George 2008 Family History Expo. Shortly after introducing ourselves to each other, she whipped out her digital recorder and asked if she could interview me for an upcoming episode of her podcast. Was I ever surprised! You can hear our interview at Episode #44. This time around, Lisa interviewed me on camera for an upcoming Genealogy Gems TV episode. As soon as I know when it will be broadcasted, I will let you know. Lisa is a wonderful person to chat with. She shares her beautiful smile as well as her genealogy knowledge with all. I had a great time catching up with her. Although I don't have a photo, I did have the opportunity of meeting Colleen McHugh of Orations of OMcHodoy. I am pleased she attended my session "Tracking Your Ancestors on the Internet: Points of Entry". I hope the information I shared will be helpful. 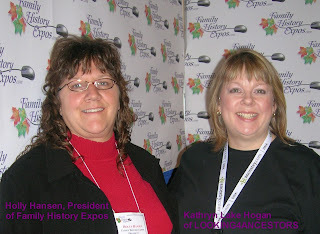 I am looking forward at the next Family History Expo which is being held in St. George, Utah, February 27 & 28, 2009. I hope to see you there!